The development of reliable methods for the calculation of phase equilibria covering a large range of applicability requires that most of the published phase equilibrium information should be available in computer readable form. This was the reason that the Dortmund Data Bank (DDB) was started in 1973 at the University of Dortmund with the intention of employing the vast store of published VLE data for the development of predictive methods for vapor-liquid equilibria. 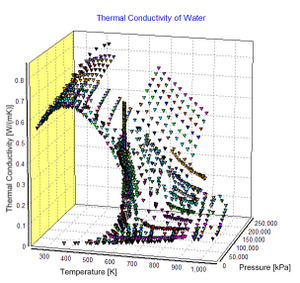 Today the DDB represents the largest computerized data bank for thermodynamic pure component and mixture properties. Besides data from the open literature, also a large number of data from private communications or company data can be found in the DDB. These include e.g. a large amount data points for mixtures containing ionic liquids, a large collection of data for pharmaceutical compounds and intermediates, and biodiesel related data. Following the great success of the Dortmund Data Bank (DDB) for mixture data (phase equilibria, excess properties, ...) and the models developed on the basis of these data (UNIFAC, mod. UNIFAC, PSRK, LIQUAC), the development of a pure component database (DDB-PURE) was a further step to supply the industry with the required experimental data, reliable predictive methods, reliable correlation parameters and modern software for the correlation and estimation of thermophysical data. In cooperation with research groups in different countries and financed by the German and Austrian federal ministries for research and technology all worldwide published data are collected and stored in a factual database. In contrast to other collections, also East European and Asian literature is carefully evaluated, especially with respect to deposited documents. The research groups are, besides the DDBST GmbH, FIZ CHEMIE Berlin, the Institute of Chemical Technology in Prague, the Estonian Academy of Sciences, the Technical University of Minsk and a group at the Technical University of Graz. The project started in 1992 and terminated in August 1998. It was followed up by a continuation project sponsored by FIZ CHEMIE and DDBST which ended in August 2001. Regular update of the data base is now accomplished by DDBST and FIZ CHEMIE. In addition to existing procedures for the selection of selective solvents, which are based on reviewing mixture databases, work started on designing molecules with specified properties based only on group contribution models (Computer Aided Molecular Design). The basic idea is to compose substances by the groups of a method like e.g. UNIFAC. The goal is building complete and correct molecules during the algorithm. Already at the current state, the amount of data in DDB-Pure greatly exceeds the contents of many competing data banks, which makes the DDB one of the largest sources for thermo physical data of pure components and mixtures.